You can use real egg shells to make beautiful decoupage window eggs – without having to blow out the egg before making your breakfast omelette. 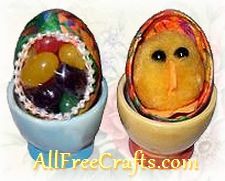 Just crack the eggs in half, as you normally would, then follow our free directions to decoupage them together, incorporating a window opening to show the surprise candy inside or to enclose a special Easter treat. Please see the Pompom Easter Chick project if you’d also like to make the little chick shown nestled inside one of our decoupaged window eggs. 1. Wash both halves of the cracked egg shells and let dry. 2. Hold the bottom part of one egg shell in your hand, and use the fingers of the other hand to pinch away the beginning of the window opening shape. This doesn’t have to be neat; all you want to do is make a small opening that you can expand on in the next steps. 2. Fit the two parts of the egg together. Note where the opening has been started on the bottom, and make a corresponding opening on the top half in the same way. When you fit the two halves together, you should have what looks like a complete egg with a small hole in the middle. 3. Draw a pencil line around the small hole to the final size and shape that you want for your window opening. Use small sharp scissors to cut the bottom opening using small snipping motions. Repeat to make the top opening. For the candy surprise egg, put a few jelly beans in a plastic bag and set the bag in the bottom half of the egg. Carefully test fit the top half, and adjust the size of the candy bag, if necessary, until the top fits snugly over the bottom, with the bag enclosed. Tear tissue paper or paper napkins into small pieces. Hold the egg together between your thumb and fingers. With the other hand, paint thinned white glue or decoupage medium onto a small section on the outside of the egg, covering the crack. Press a torn piece of paper onto the glue, then cover it by brushing on more glue or decoupage medium. Add more pieces of paper in the same way, overlapping them as you go. Decoupage right up to, but not past, the edges of the window opening. Continue decoupaging until the outside of the egg is covered. Let dry. If desired, you can glue thin ribbon, a string of pearls or gold cording around the window opening. This window egg is meant to enclose a small Easter toy or other surprise. Because the opening isn’t covered by plastic, the inside of the egg is decoupaged as well. Begin by holding the egg together and temporarily securing the inside of the egg with a few short pieces of scotch tape placed over the crack. Next, tear an ample supply of small pieces of paper. Paint a small inside section of the egg with thinned glue or decoupage medium. Press the first piece of paper into the glue, then coat with another layer of glue. Add more paper pieces like this, overlapping each piece, and decoupaging over the scotch tape where necessary. Fold over any pieces that extend past the opening and glue the folded area on the outside. Continue decoupaging the egg, inside and out, until it is completely covered. Let dry and fill with a small Easter toy or other surprise.